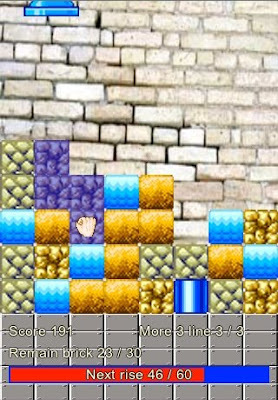 Brick Keeper is addictive puzzle game to playing with bricks. It's simple, fun and attractive game. If you drag more than 2 blocks of the same shaped, blocks are removed. As you remove more blocks at a time, you get more points. As time goes by, blocks come up step by step and a block of the top gets at the ceiling, game is over. There are diverse stages and each stage, blocks are created new. You can compete with others via online ranking system. - Drag blocks of the same-shaped and remove them. - Click item to use. - If the left or right side is empty, you can drag blocks to move. - Just remove blocks as you can as each stage. - Bomb : remove neighboring whole blocks. - Earthquake : blocks go up above a line or below. - Timer : delay time that blocks come up. - Laser : melt the whole blocks in the line. - Random : you can get one item among all as above or new block. It is really easy and fun. Enjoy now!